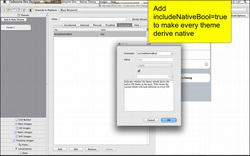 You can easily create a theme with any look you desire or you can "inherit" the platform native theme and start from that point. When adding a new theme you are given the option. 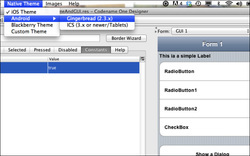 Codename One uses a theme constant called "includeNativeBool", when that constant is set to true Codename One starts by loading the native theme first and then applying all the theme settings. 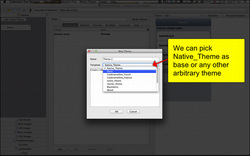 This effectively means your theme "derives" the style of the native theme first, similar to the cascading effect of CSS. By avoiding this flag you can create themes that look EXACTLY the same on all platforms. Developers can pick the platform of their liking and see how the theme will appear in that particular platform by selecting it and having the preview update on the fly. 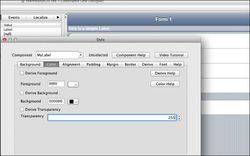 In this case we just customized the UIID of a label and created a style for the new UIID. When deriving a native theme its important to check the various platform options to make sure that basic assumptions aren't violated. E.g. labels might be transparent on one platform but opaque on others. Or labels might look good in a dialog in Android but look horrible in an iOS dialog (hint: use the DialogBody UIID for text content within a dialog). A common case we run into when adapting for platform specific looks is that a specific resource should be different to match the platform conventions. 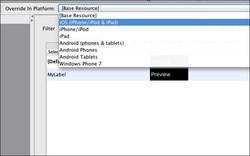 The Override feature allows us to define resources that are specific to a given platform combination. 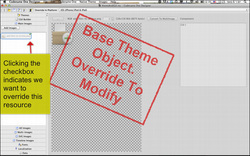 Override resources take precedence over embedded resources thus allowing us to change the look or even behavior (when overriding a GUI builder element) for a specific platform/OS. 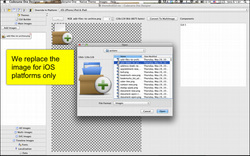 Then click the green checkbox to define that this resource is specific to this platform. All resources added at this point will only apply to the given platform. If you change your mind and are no longer interested in a particular override just delete it in the override mode and it will no longer be overridden. This is easily done by selecting the "..." button. We can easily do the same in the GUI builder although this is a dangerous road to start following since it might end up with a great deal of fragmentation. The Java(tm) logo and name are trademarks of Oracle corp.